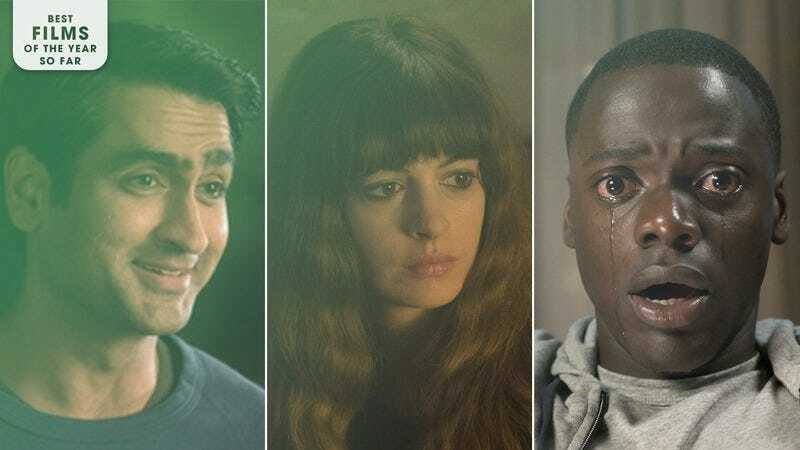 Kumail Nanjiani in The Big Sick (Photo: Lionsgate/Amazon), Anne Hathaway in Colossal (Photo: Neon), and Daniel Kaluuya in Get Out (Photo: Universal). Graphic: Marcus Nuccio. Every summer, The A.V. Club offers an unranked list of the best movies to be released theatrically (and, going forward, on major streaming platforms) during the first half of the year. It’s meant to be a kind of catch-up guide, a way for readers to keep pace with the year in film and start checking off significant titles before the mad rush of awards season. Still, even getting through this inventory of 20 halftime highlights may require more hours than the average viewer can spare in front of a big or small screen. That’s why we’ve gone ahead and narrowed it down further this year by prefacing each movie with a reason to watch, in the hopes that this may help the cinema-starved make a more educated selection. We’ve also, to the best of our abilities, identified how and where you can see each of the films. Watch it if… you wish more crime movies had elaborate musical numbers and more musicals had high-octane car chases. Watch it if… you want to believe that “Apatovian” can still be a big compliment. Watch it if… you think Sally Draper deserves her own horror-movie spinoff. Watch it if… Godzilla left you hankering for something different. Watch it if… you find the Trump administration’s deportation policy needlessly cruel and could use a reminder that you’re not alone. Watch it if… you’d rather see social commentary in entertainment than on Twitter. Watch it if… you’d rather take an uppercut from Mike Tyson than sit through another clichéd boxing biopic. Watch it if… you value unpredictability over uplift. Watch it if… a traumatic night at the movies is your idea of fun. Watch it if… you think the back-alley fight from They Live could have been longer. Watch it if… you’re a history buff who can’t resist a mystery. Watch it if… you’re a devoted Deadhead or someone who’s never understood what the fuss is all about. Watch it if… you wish they’d make them like they used to. Watch it if… you’re the type of guy or gal who laughs at a funeral. Watch it if… you like your horror stylish with a side of sickening. Watch it if… a revenge drama that’s really anti-revenge seems impossible to you. Watch it if… you’ve kept your fingers crossed waiting for an M. Night Shyamalan comeback. Watch it if… you’re looking for a religious movie that does more than preach to the choir.